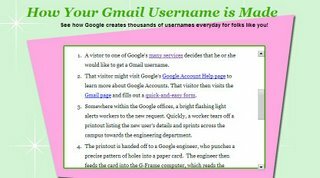 "Every day, eager workers at Google's corporate headquarters in sunny California start their day with a wholesome breakfast (a hungry worker isn't a happy worker), and then get to task creating new Gmail usernames for the thousands of users that sign up every single day!" 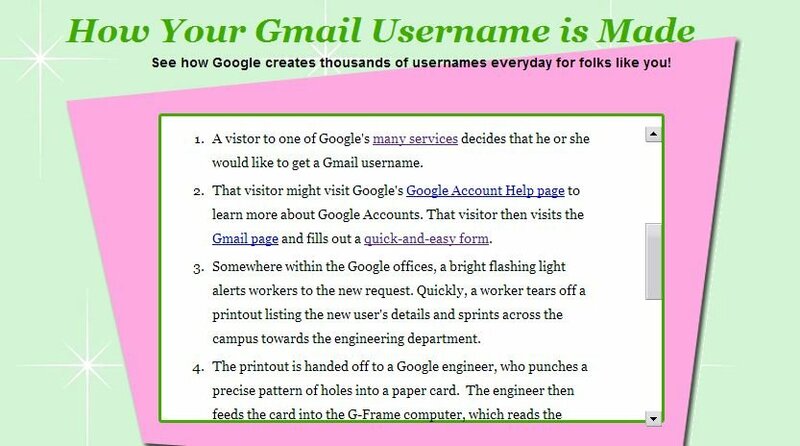 That's how the story of creating Gmail usernames begins. For the rest of it, visit http://yourgmailusername.googlepages.com and enjoy. In case you were wondering, Segway is an electric mini-scooter that Googlers use to commute from one office to another and YES, this page was created by Google.